I don't often cook steaks. I have nothing against steak, but I feel like whenever I cook them, I cook them for too long, and I can never quite achieve the medium-rare-ness I'm going for. When I saw (I thought) that this recipe was done under the broiler, I got excited. Yay! It's telling me exactly how to cook these, and it's all done under the broiler with little effort on my part! Yay! So I was preparing to cook these steaks under the broiler, and Dennis happened into the kitchen and noticed the broiler was on. "How are you cooking those steaks?" he asked. I indicated the broiler that was on, in kind of a duh sort of way. "Broiler." "You're cooking the steaks under a broiler?" I showed him the herb crust mixture. "Sarah, if you put those steaks under the broiler until they're cooked, your breadcrumbs are going to burst into flames." 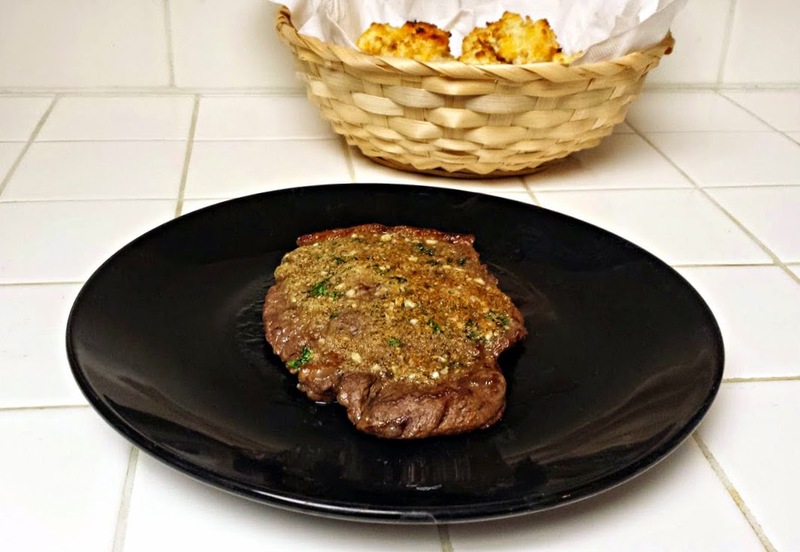 All that to say, read the recipes thoroughly, lest your breadcrumbs burst into flames, and make these steaks, because when all was said and done, this and Wednesday's cheddar garlic biscuits (along with a salad) made a fantastic meal! Combine the herb crust ingredients (garlic, parsley, breadcrumbs, butter, salt, and pepper). Blend well and set aside. 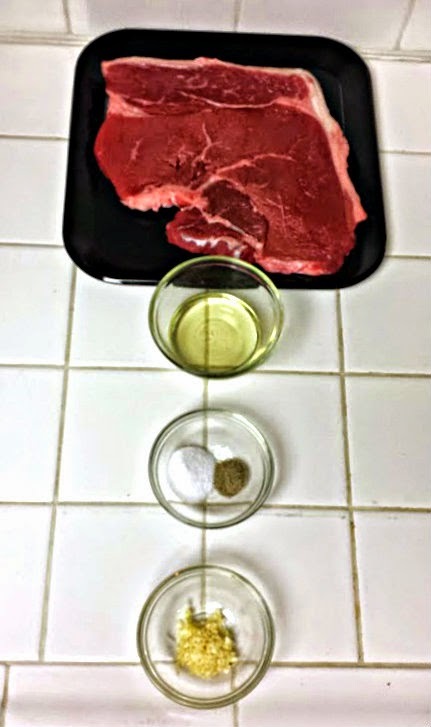 Season the steaks with the remaining salt and pepper. 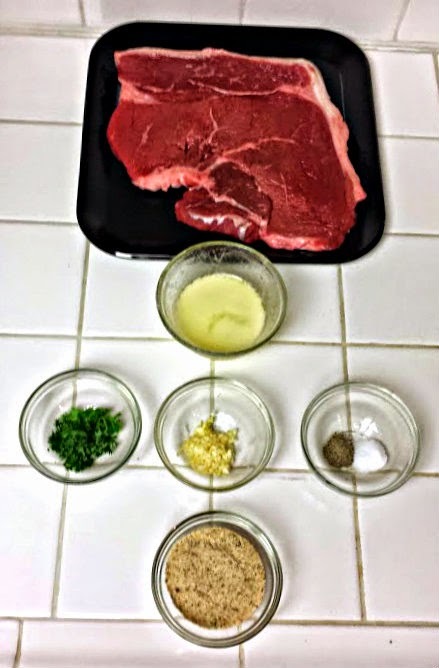 In a small bowl, combine the remaining garlic and the vegetable oil and rub this mixture onto each side of both steaks. Cook your steaks in a pan over medium high heat until they reach your desired temperature. (For medium-well, cook for 8 minutes or so.) Make sure to flip halfway through your desired cooking time. 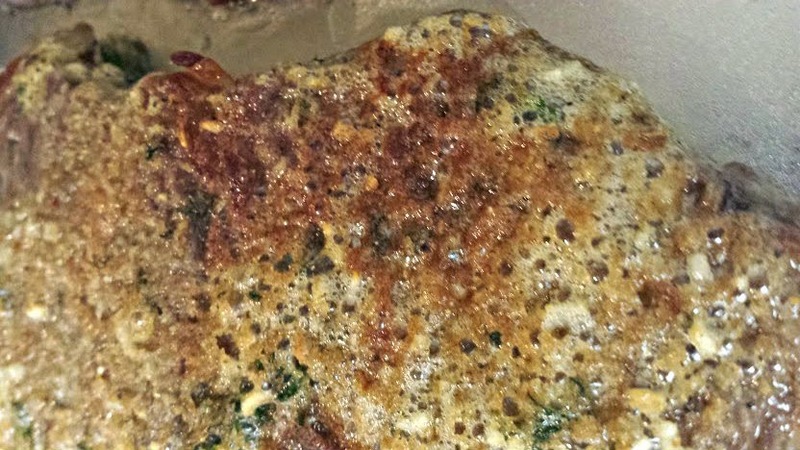 Remove the pan from heat and spoon the herb crust mixture on one side of each steak. 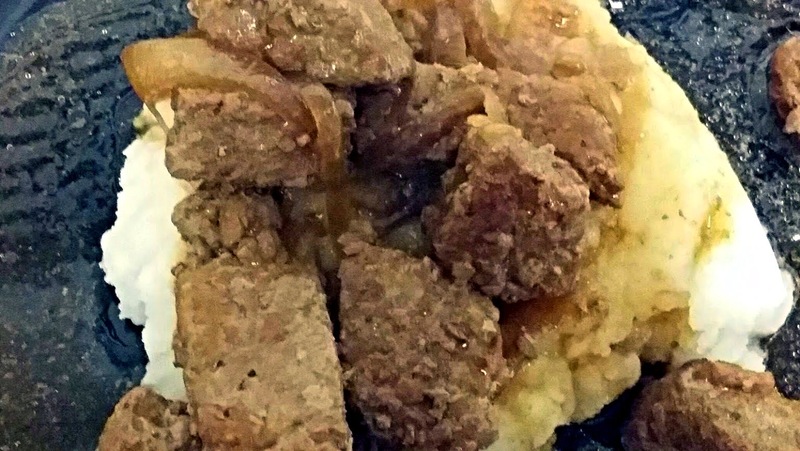 Press mixture into steak. Place the pan under the broiler and broil for 2-3 minutes, until the crust turns golden brown, and before your breadcrumbs burst into flames. Allow steaks to sit for 3 minutes or so before serving. This recipe is stupidly easy. Like...I can't even convey to you guys how stupidly easy it is. 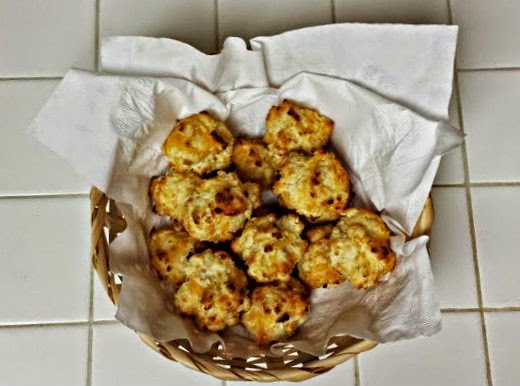 But, if your house is anything like mine, what's going to happen is people will eat them and say, "Hey, these taste exactly like those Red Lobster biscuits." I made these to go with the steak that will be posted on Wednesday, and the meal was a huge success. This cookbook is one I got from the library book sale back in North Carolina, and I've meant to make things out of it several times, but I never quite got around to it. You can tell by all of the dog-eared pages in the book that my intentions were good. It's funny, because it's something of a "cooking for single gals" kind of cookbook, and I am clearly not in that demographic, but it's one of my favorite cookbooks I've read. (I read cookbooks. Is that weird? That might be weird.) I like the recipes, as well as the fact that there's quasi-dating advice in it, and also tips for having a put-together kitchen. 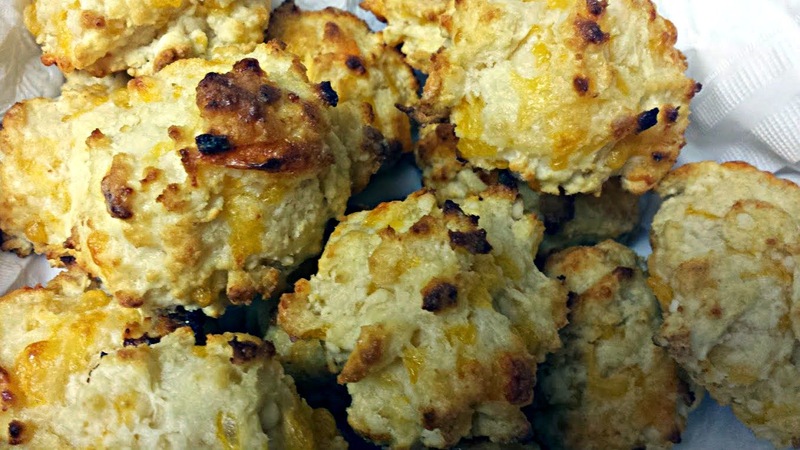 Even if you just read food blogs to see what you could make if you ever set foot in your kitchen, make these. Trust me. 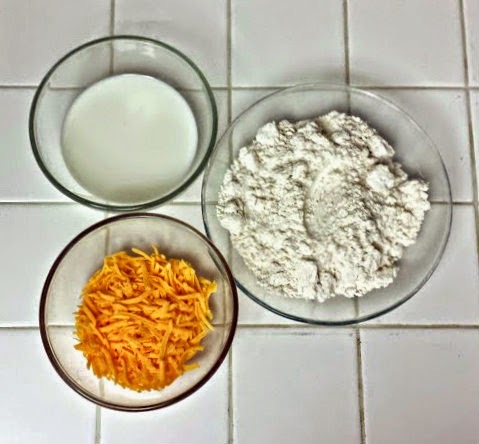 Combine the baking mix, milk, and cheese in a medium bowl until you get a soft dough. Drop the dough in large tablespoonfuls onto an ungreased cookie sheet. Mix the garlic powder and butter in a small bowl and brush the mixture over the hot biscuits. Serve immediately and accept compliments and Red Lobster comparisons. This year, I participated the in Great Food Blogger Cookie Swap, which sends cookies made by food bloggers all over the place to other food bloggers. 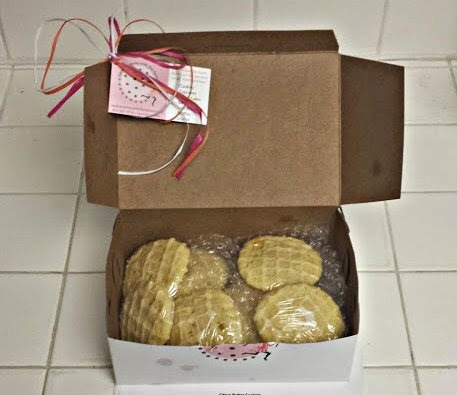 I received the names of three bloggers to send my cookies to, and three other bloggers received my name, basically. 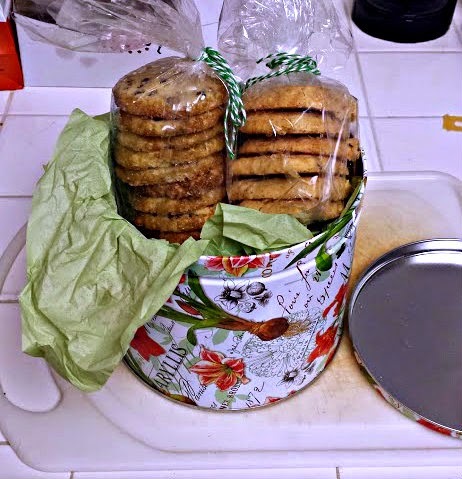 It was really fun getting cookies in the mail, and everyone that sent them to me went all out! 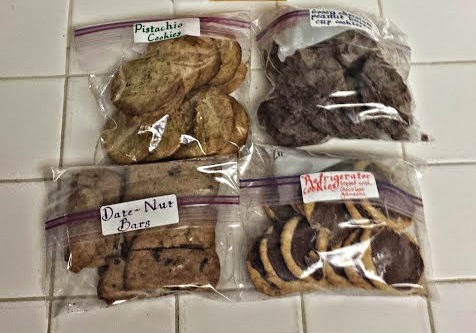 Pistachio cookies, chocolate peanut butter cup cookies, date nut bars, and refrigerator cookies. I was so surprised to get so many, and they were awesome! Sara at Sara Ran Away with the Spoon sent me some ridiculously good citrus butter cookies that were in an adorable box AND individually wrapped! And last, but most assuredly not least, Brett at Green Thumb White Apron sent me ridiculous, RIDICULOUS shortbread chocolate chip cookies and these savory shortbread cheese cookies. Dennis and I nearly came to blows over the cheese ones -- they were some of the best things I've ever had. I can't wait for Brett to post the recipe for these. As for me, I took a recipe out of the Mrs. Fields Cookie Book. These Double Chocolate Chocolate Chip Cookies were pretty good. (They were no cheese biscuits, though!) 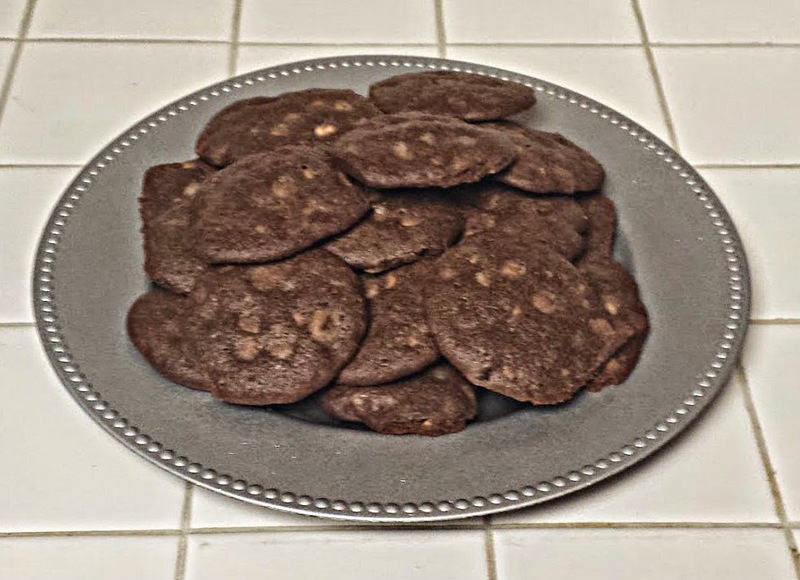 Instead of using chopped chocolate, I used chips, and these would for sure be a nice addition to any holiday cookie exchange! 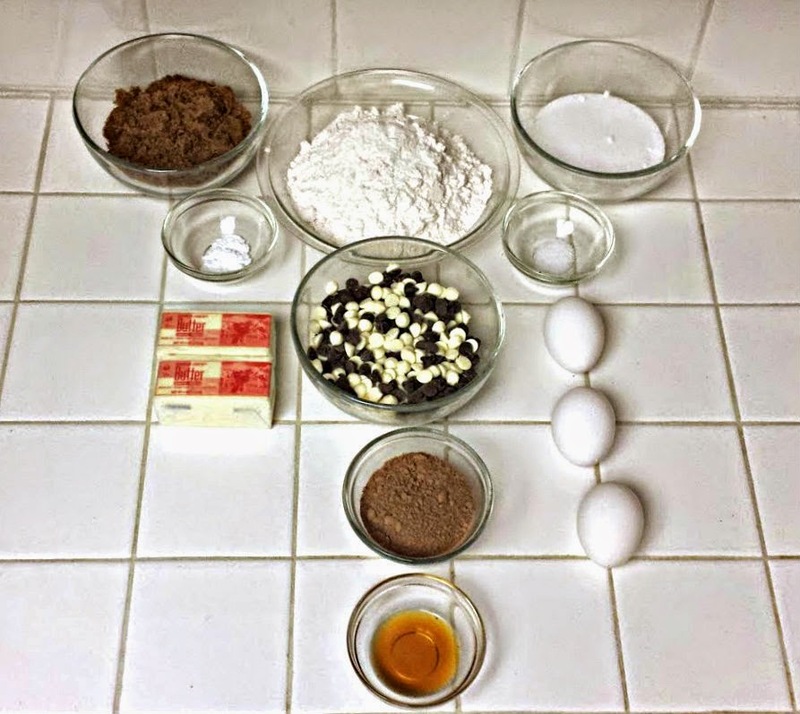 In a medium bowl, combine flour, cocoa powder, baking soda, and salt. Mix well and set aside. 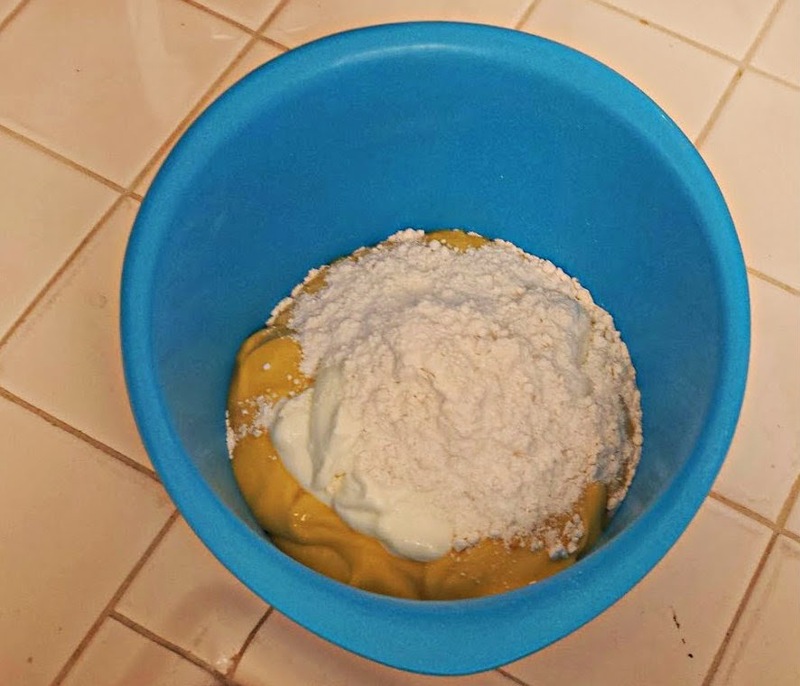 Blend the sugars in a large bowl using a mixer. (I used my KitchenAid.) Add butter and mix until well combined. Add eggs and vanilla and beat at medium speed until the batter is smooth. Add the flour mixture and the two chocolates to the sugar mixture and blend at a low speed until just combined. 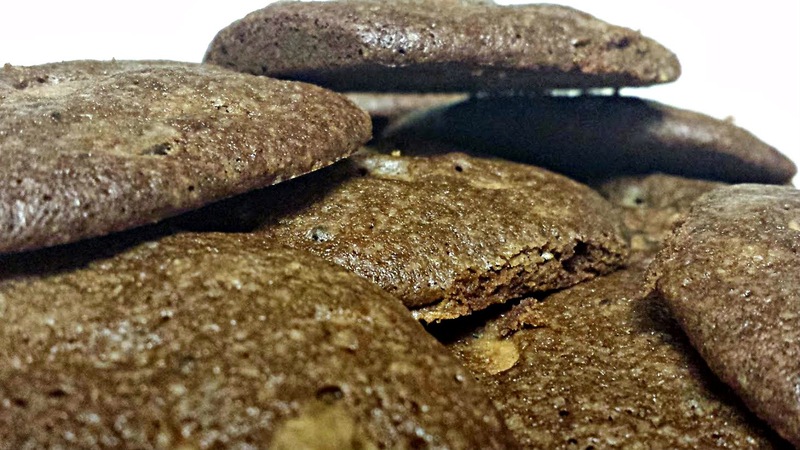 Drop the dough by tablespoonfuls onto an ungreased cookie sheet, about 2 inches apart. Bake 23-25 minutes. After the cookies are baked, transfer them to a cool, flat surface. 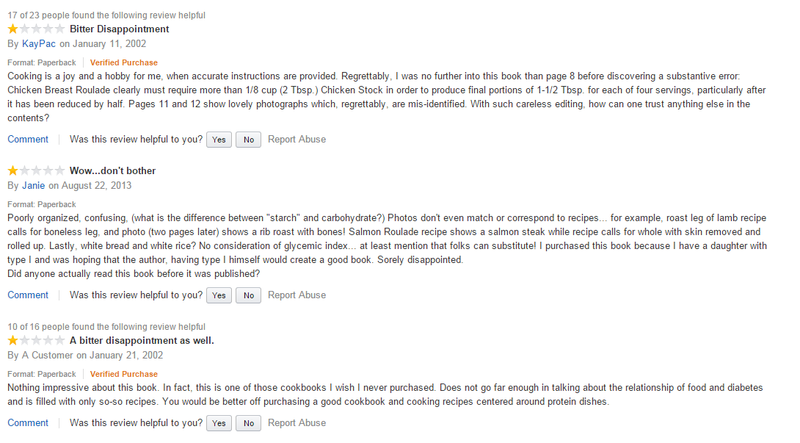 I think I've run into one of the editing issues that had one Amazon reviewer giving this cookbook one star. 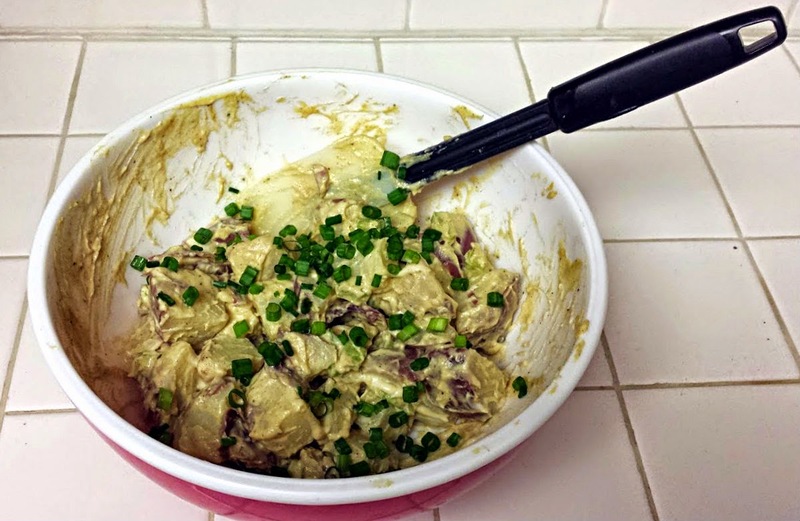 The actual name of this recipe on the page is Red Potato Salad. However, after I made it, I had to look it up again in the index, and it was called Red Bliss Potato Salad. I guess bliss is subjective. 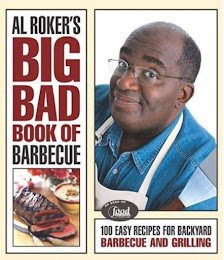 It was weird to me that there was a recipe for potato salad in this book, because potatoes are notorious for giving diabetics fits with their blood sugar levels. But obviously, that didn't deter me much. 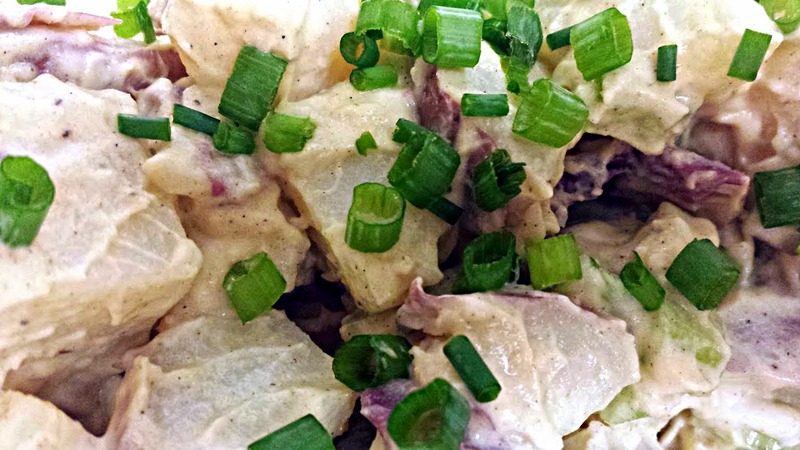 Even Dennis, who isn't the biggest fan of potato (bliss) salad, said this one was really good. I realize in other parts of the country, now is the time to be making hot stews and baking bread and sipping cider, and you're not necessarily thinking about potato salads, but I'm in Southern California, so you have to give me a little bit of a break. I didn't even think about it until I was writing this post (last month, actually), and thinking about how it was 90°F outside. Fill a large pot with 2 qt. water and bring to a boil. Poke several holes in your (clean) potatoes with a fork and add them to the pot. Bring the water to a simmer, cover, and cook for 20-25 minutes, or until the potatoes are done. Remove the potatoes from the water and let them cool. 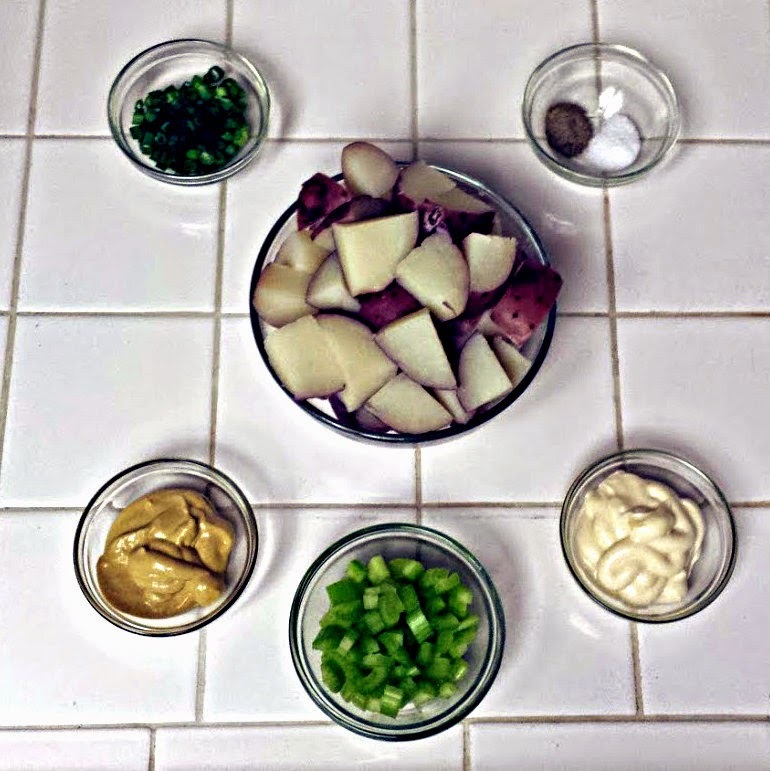 Once cooled, cut the potatoes into quarters and place them in a large bowl. 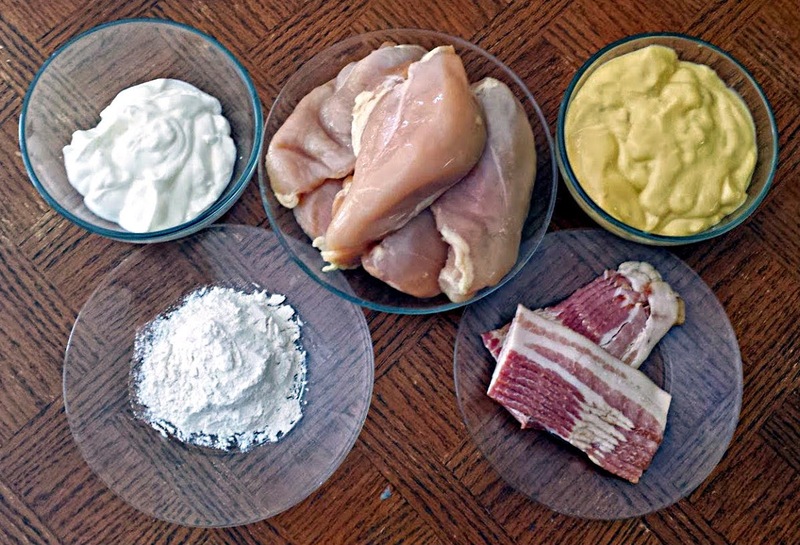 Add the celery, mayonnaise, mustard, salt, and pepper and mix gently. At this point, you can refrigerate this overnight, but you don't have to. We ate it right away. Refrigerating it helps the flavors blend, though. Regardless, garnish with the green onions prior to serving...maybe in June. 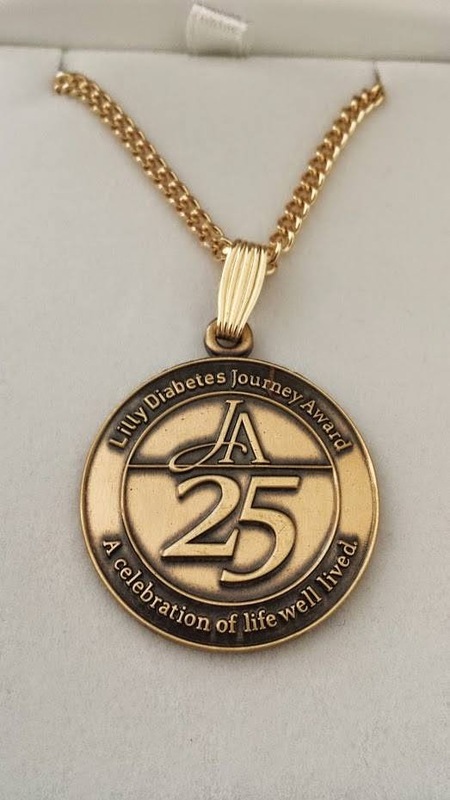 What this means for this blog is that I don't trust diabetic cookbooks. (I also don't trust sugar free candy, but that's another story entirely.) I do not trust them, because they always, always let me down. That is, until now. I have found a diabetic cookbook that I'm willing to let continue taking up space on my shelf. I decided to give it a go anyway, and I'm so glad I did. 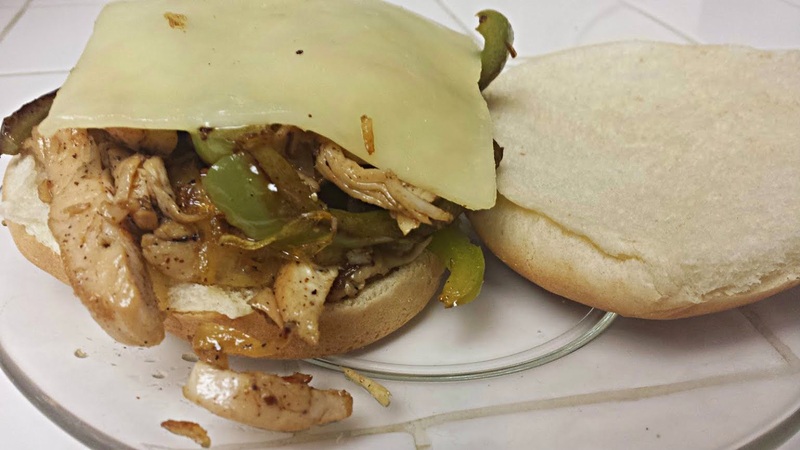 These sandwiches were simple, but really, amazingly good. Dennis loved them, I loved them...Zelda didn't get any, but that's because of the peppers and onions. Had I given her some, I'm sure she would have loved it. 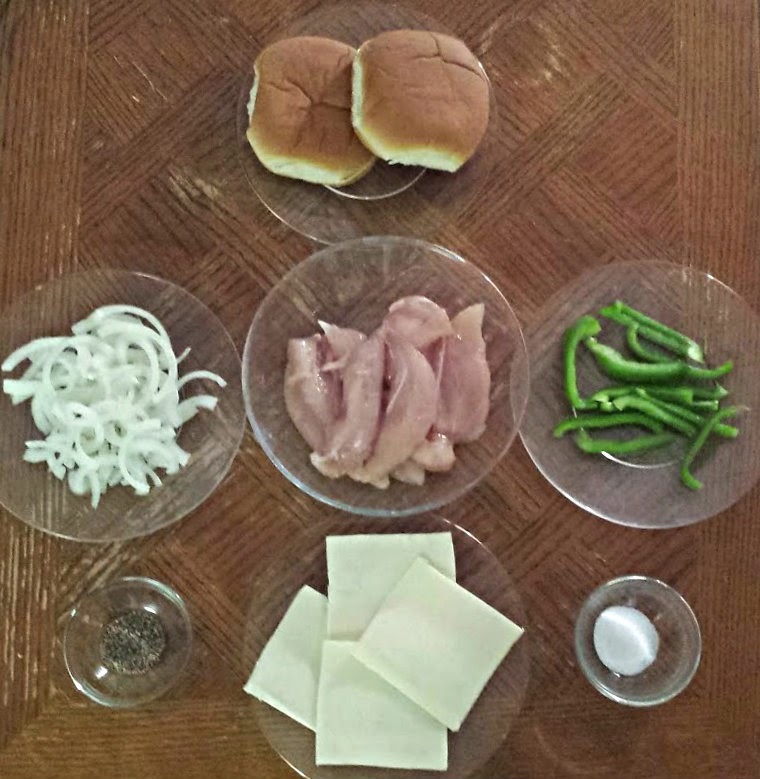 The recipe calls for hoagie buns, but I used regular hamburger buns. Use whichever -- it'll be awesome either way. 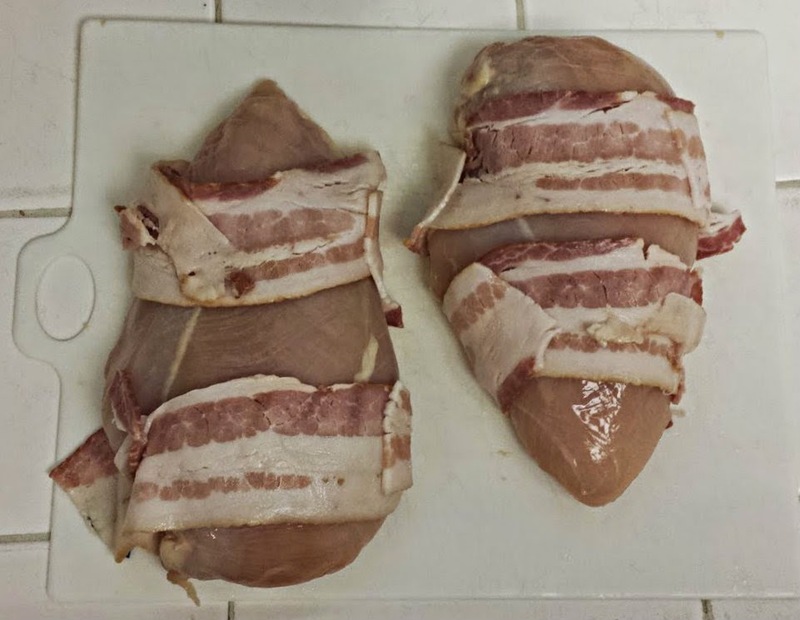 Cut the chicken breasts into 3-4 strips. Season with salt and pepper. Heat 1 Tbsp. of the olive oil in a pan over medium heat. Add the peppers and onion and saute for 3 minutes. Add the rest of the oil and the chicken to the pan. Cook until the chicken is cooked through, 165°F. 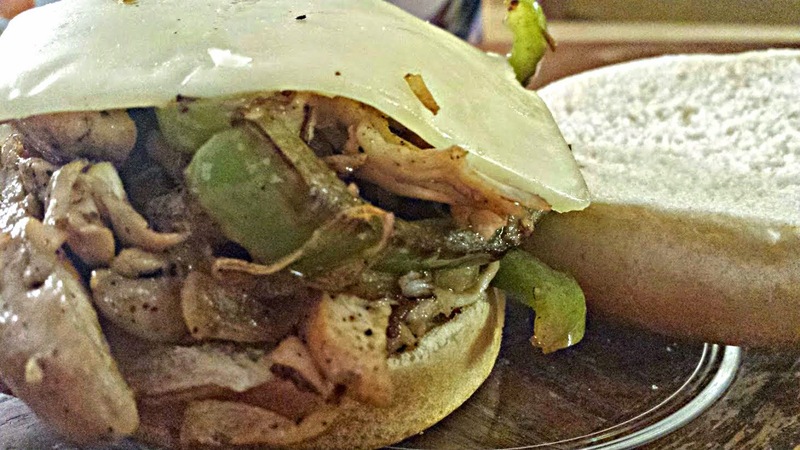 Place the chicken, onions, and peppers into your bun or on your roll. Place cheese on top and serve immediately. While this chicken was cooking, Dennis walked in and said that it smelled like his grandmother's house, and, since he had a Southern Grandmother, I took that as a high compliment. I did need to add salt to mine, but on the whole, this is a super-easy, really good dinner. 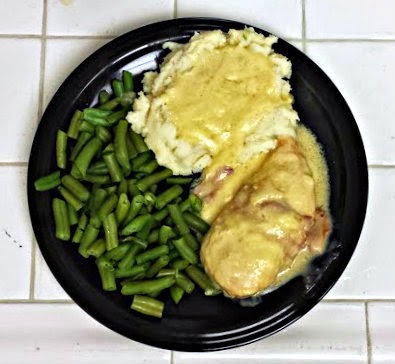 This is, as it turns out, kind of a version of something I used to have for dinner all the time when I was a kid. (The other one involved ham and no CrockPot, though.) 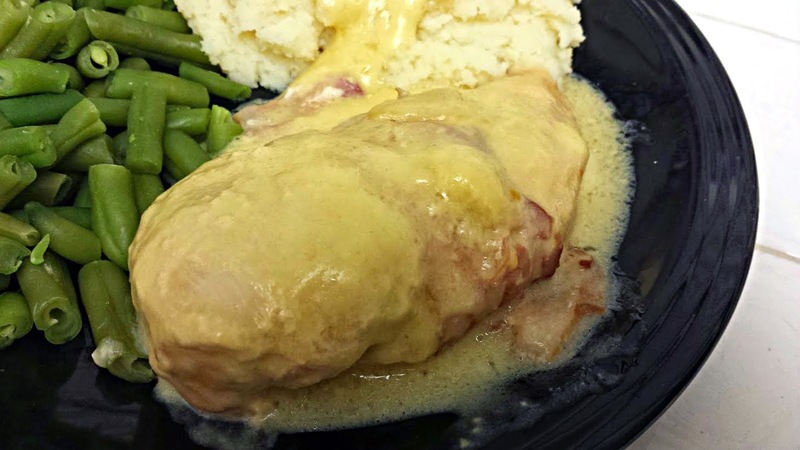 As a result, it tasted really familiar...but it was literally something I could throw in the CrockPot and forget about until dinnertime, which is a huge plus for someone like me who commutes an hour each way every day. 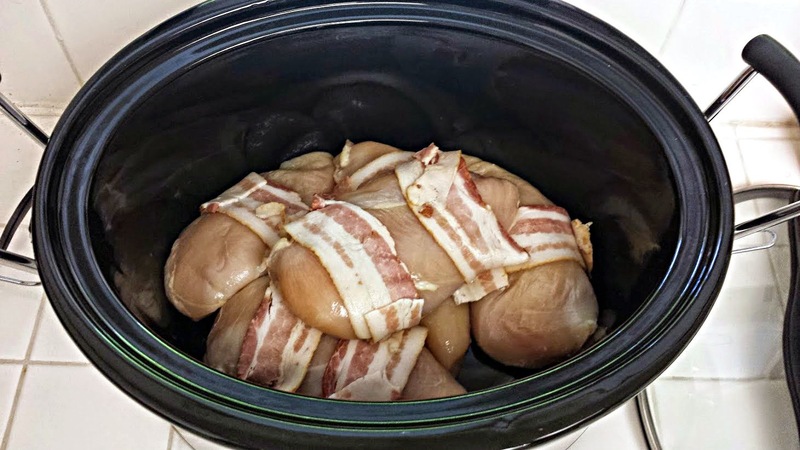 ...and place the chicken in your CrockPot. In a separate bowl, combine soups, sour cream, and flour. Add salt to taste, and serve with rice or mashed potatoes. I told you guys I'd be back in December -- just in time for the holidays! You'd think that I would have taken this time off to learn better food photography and better blogging techniques and stockpile enough recipes to take me through next year. So before I get started with the recipe, I'm going to make some commentary. The reason I took my couple of months' break was because blogging got...tiresome. I do it because I love writing and I love food and I love taking pictures of food, and it all seemed to work together. But then I got tired. I got tired, and it was stressful, and there was no...return. Does that make sense? There are a few people I know read my little corner of the Internet, and I'm glad they read it and enjoy it, but then I was looking at these people who do blogging, food and otherwise, and I was like, why don't I have that community? I don't know how to build that kind of thing. But then I decided that that's OK. I'll keep plugging away, and I know at least a few people (including my high school boyfriend, as it turns out, even though he and his fiancee are Vegan now, apparently?) like what I'm doing, and that's enough for me! Also, I think I'm going to attempt to do what I see a lot of people do, and...tell you more. Bloggers seem to have stories, and they tell people about their lives, and maybe I'll try that. Or maybe I'll feel awkward and just give you recipes. Maybe I'll take more (good) pictures. It's all a work in progress. Also, for December, I'm going to switch up the format a little, and while I'm still going to try my 3-per-week posts, on Fridays, I'm going to post things from Christmas cookbooks. Because when else am I going to use those? After December, I'm thinking of making Fridays days for Pinterest recipes or something. Not sure yet. I'm still work-shopping that one. I made this back in November for mine and Dennis' 3-year-anniversary, and it was really, really good! It comes from a cookbook by a lady I met back in NC and that I really like. She's super sweet, and has written several "Fat Little" cookbooks. I own at least two of them, but I suspect it's actually three. She also runs Kitcheneez, which is hard to describe, but I think of it as Avon for food people. She's created all these great mixes and marinades and seasonings and drink mixes and etc. and they're sold via consultants. (This isn't a sponsored post, by the way. I just really like Lisa and her cookbooks and her products!) Dennis and I have tried several of them, and they're always really good. 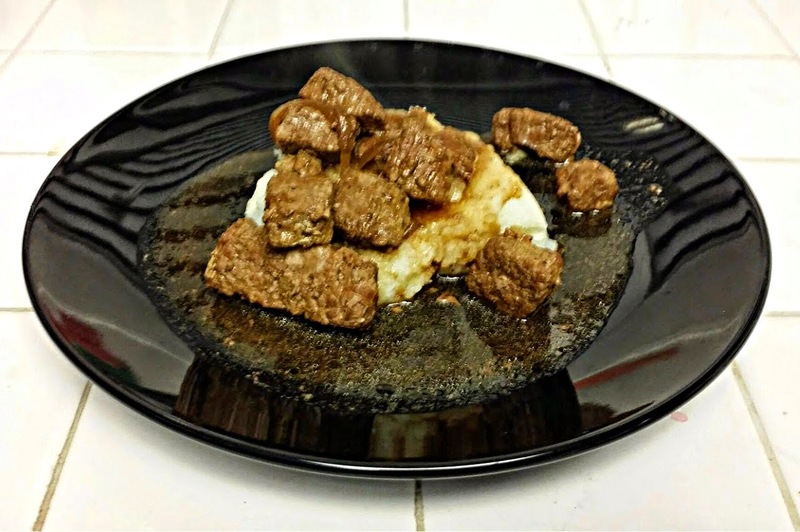 So this week, I've got two recipes from her Crock Pot cookbook. This is my favorite out of the two, but they're both really good. I hope you guys enjoy this one. And it's good to be back! Add the olive oil in a large skillet over medium-high heat. Add the onion and saute until tender. Add the meat to the pan and brown on all sides, making sure not to overcook, 3-5 minutes tops. 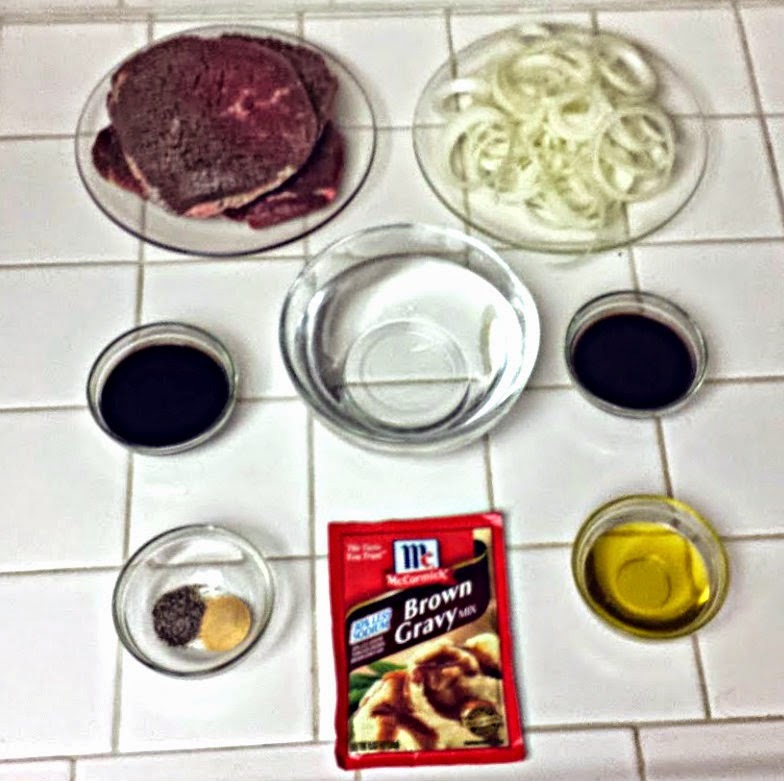 In the CrockPot bowl, combine the water, gravy mix, soy sauce, Worcestershire, garlic powder, and pepper. Mix well. Add the meat and onions to the CrockPot. Cover and cook on low 5-7 hours. Salt to taste before eating.